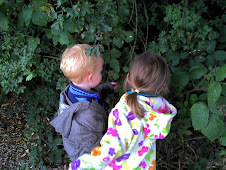 Little Garden Helpers: Will we fall in? The snow remains and as a result we have been busy indoors. Today it is drizzling snow which isn't quite as nice as the big fluffy snowflakes that came down earlier in the week and we are less tempted to go in the garden and play in it. So instead we have been painting lots; cards, canvas and a tea set. We have also moved all Garden Boy's things into his big sisters bedroom as they are now going to share. Garden girl loves having her little brother in the same roon, while Garden Boy who is still confined to his cot till his bed is delivered is just waiting till he can escape at bedtime. I think we have fun and games ahead! We have also been busy in the kitchen, with today's yummy creation being the trifle we never got around to making at Christmas. Being stuck indoors therefore has its benefits. Jobs are getting done, yummy food is being made and fun is being had. The snow is also bringing out the best of Garden Girl's imagination (or perhaps just the most delightful of her misunderstandings), so I will leave you with another amusing thought. Funny how the snow shifts us all into a fresh way of seeing the world around us. So sweet, this observation. Happy snow!